Back when you were writing Sullivan's Island, did you plan on doing a sequel at some point? I think that a first novel is like a first child in many ways. The entire experience is one surprise after another. Somehow it's your sentimental favorite because you have brought something to life for the first time and you never get over it. So, ten years and thousands of emails later, I have had so many people ask for a sequel it began to seem like a good idea. It was a good idea but it was also a crazy idea for many good reasons. Return to Sullivans Island focuses on the next generation -- Susan Hayes's daughter Beth, and Cecily Singleton, the granddaughter of the wonderful Livvie Singleton. Were there any challenges in writing from the perspective of two young women, one barely in her twenties? Nope. I have one of my own and a constant stream of her friends, male and female, coming and going. Twenty-three year old young men and women are adults only lacking in experience and judgment, not values or raw intelligence. Did Beth and Cecily's characters "speak" to you, or were you clear about who they would be and how the events in the story would unfold? Livvie in SULLIVAN'S ISLAND was an idealized character and Cecily is RETURN TO SULLIVANS ISLAND is idealized to some extent but has some flaws, making her more authentic. I knew that I wanted her relationship with Beth to somehow mirror Livvie's with Susan but by bringing them into the twenty-first century, it gave me the opportunity to make them closer in age and to make them genuine friends. 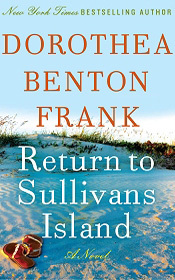 Beth needed a savior the same way her mother did but the differences in their generation made it easier to make all the characters of RETURN TO SULLIVANS ISLAND more empowered to take control of their lives and less reticent to be honest with each other. You were born and raised on Sullivans Island. Tell us about the place you knew growing up. What's most special to you about Sullivans Island and the Carolina Lowcountry? The island families all knew each other. All the children played together. No one had a dog with a pedigree or seatbelts in their cars. Hollywood was on another planet for daydreamers and baseball was king. Manners, ethics and morals mattered a great deal. I don't think we had much money but then I don't think it mattered because we always seemed to acquire the things that mattered most – bicycles being the most highly coveted items at Christmas. How we lived our lived was dictated by the tide clock and the liturgical calendar of the Catholic Church. What's most special about the Carolina Lowcountry is that it is the blood soaked land of my ancestors and every inch of it is excruciating in its natural beauty. Gullah culture is infused in your novels. What draws you to Gullah? What can we learn from it? One of the charms of the Hamilton-Hayes family spread, the Island Gamble, is that it is haunted. Do you believe in ghosts? Have you had any interesting experiences with the supernatural? As a true daughter of the Lowcountry I believe in spirits. There is no such thing as an uninteresting experience with the supernatural. Is there a real house like the Island Gamble you drew on for the novels? The Island Gamble is drawn on the house where I grew up which was actually called The Vagabond Villa. But for the sake of the story I moved it down the island and expanded it. You touch on the subject of race with grace and compassion. As Beth enjoys her close friendship with Cecily she thinks of the strictures placed upon the relationship between her mother and Livvie. Why did you choose to include this? Because it's important to remind people that prejudice is just plain dead wrong – whether it is gender based, racial, religious – pick a category – it's all so wrong. You've previously mentioned that you "grew up in a Southern gothic novel." What does that meanand how has it shaped your work? My mother and her mother before her were unapologetic Camilles when it suited them and Steel Magnolias too. They loved us with all the ferocity of a couple of lionesses enjoying a good julep but they also knew the value of a swoon. You learn a lot from women like them. Are there more stories about the Hamilton and Hayes waiting to be told? AND/OR what can fans look forward to next from Dorothy Benton Frank? You mean Dorothea? Honey, Dorothy is from Kansas . . .
Well, my brother Mike said I should take all the characters from all my books, send them on a cruise together, shipwreck them on an uncharted island in the Caribbean and see what happens. I'm thinking no to that. Right now I am playing around with a sequel to PLANTATION, glutton for punishment that I seem to be! Maybe at some point we'll have to have a wedding for Beth. A good wedding story is always fun. I don't know . . . what would the readers like to read? Maybe something about a naughty vampire talking dog from the Lowcountry with a fondness for howling at the moon in Gullah? We could call him Harley and have him ride one with his mistress named Lee – call it Harley and Lee? Nah. I think I'm sticking with what I do . . . spinning yarns about Lowcountry magic and how important everyone's heart is.